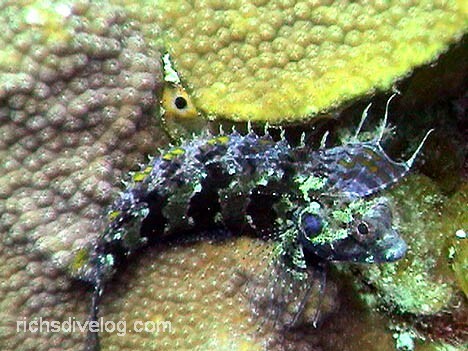 This quillfin blenny is a new fish for me. Dive Journal: 3/12/2005 – During last year’s spring break, we tried and failed to book at Small Hope Bay Lodge for the week. This year Linda is successful. We pack up from home and head out about 4:30AM for the airport. We stop first in Houston, then in Fort Lauderdale. We take a taxi transfer to the Aviation Center, then begin looking for our charter out to Andros. No one is at the desk, so Linda tries to raise Alex Blackwell through his cell phone. He eventually shows up, and he alone comprises the entire flight team. We help load luggage onto his tiny 5-seater plane, which appears to have seen a long life. Soon we are skimming out over the south Florida coast on a southeasterly direction toward the Bahamas. The plane flies only about 2500 feet, and the views of the ocean and the islands of Bimini are wonderful. We approach and examine the west edge of Andros. It is uninhabited and flat, consisting of creeks, deltas, brilliant turquoise marshes, sands, and sparse vegetation. The vegetation increases as we continue to cruise southeast and we eventually site our small landing strip called the Andros Town Airport. Customs is a snap and we’re soon piled in a van and headed to Small Hope Bay Lodge. We chat with the friendly driver a bit, who tells us his favorite island restaurant is the “Taste and See”. It is a quick trip through the settlement called Fresh Creek (also called Coakley Town), and the van pulls up a long driveway and stops in front of a lodge and outdoor bar. Tracy comes out to welcome us and to signal the driver off to our rooms with the luggage, while she then begins a quick escorted tour of the resort and its operations. Her first offer is to fix us a drink at the bar, so we’re sipping on Kaliks in no time flat. After exploring around the grounds, we congregate in the main lodge for happy hour, and find it full of guests who all seem to know each other. We bravely edge into the fray and soon strike up with a very pleasant couple from upstate New York. He’s into chemical machining while she’s into mushrooms. Yummy conch fritters and dipping sauce are brought around. Dive instructor Shannon joins our circle to take note of our plans for tomorrow. She explains that it is usually better to plan to dive, then cancel at the last minute, so the dive staff can get tanks ready. This is even more true since Linda, Janel and I are planning to dive nitrox for all the medium deep dives. Dinner is announced by the chef, who enters the room wearing full chef attire, greats everyone, “Good night”, and formally announces each course that has been prepared. He gets oohs and aahs and then a warm round of applause. The dishes are served buffet-style and all the guests and staff mix together at the tables, again, a good opportunity to meet people. It’s been a long day of travel, and Linda and I are still clinging to our rat-race stresses, so following dinner we are ready for an early turn-in. 3/13/2005 We awaken to the sun filtering through the batik draperies and Linda is soon hunting down some coffee. Again we congregate in the main lodge and enjoy fruits, cereals, and made-to-order eggs or pancakes or French toast. There is a big chalk board posting the day’s morning and afternoon dives sites. Included are sections to sign up for specialty activities, a shark dive, night dives, and a batik lesson. Linda quickly signs up for the batik. We chat with instructor Rod for a while after breakfast, and he finally mentions that we might want to hurry it up out to the dive dock because we are required to do a check out drill before the boat launches at 9:30. The dive dock at Small Hope Bay Lodge is grand, consisting of a short walking pier and full dive shop right off the middle of the grounds. After lugging over our gear, we watch as the dive staff watches us assemble it, and then each of us is instructed to jump in, submerge, pull off mask, then pull out regulator, reassemble, and resurface. A giant stride off the boat brings the rush of cool water, and I’m immediately needing to slow down my breathing. We complete the checkout skills with no problem, but staying submerged in the 5’ shallows is a bit of a challenge. This morning’s site is called The Catacombs. After a short boat ride, we’re soon gliding down through the blue and rediscovering the bliss of diving. We explore the pretty wall at about 80 to 90 feet. Compared to other diving we’ve done, the reef life seems a little sparse, and there are frequent fuzzy dead-looking patches. 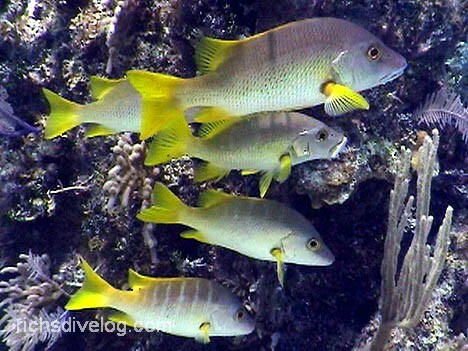 Still, we enjoy some gorgeous small schools of Creole wrasses who appear stunning blue at this depth. About halfway through the dive we cross paths with a dinner-plate-sized turtle. Our angel friends are around as well, including grays and queens, and Linda also spied a French. Linda, Janel and I are diving 32% O2 nitrox. Since our cert dives were done on 27% and 23% O2, it’s almost as if they didn’t count, so this is effectively our first real nitrox dive. Midway through this dive, John motions that we need to plane up in the water, because he’s pushing no-deco limits. I check his computer, which is edging into the yellow. Mine, on the other hand, shows plenty of margin, an immediate benefit of the nitrox at this depth. It is too soon time to surface, and everyone, especially Linda, is noting how cold the water feels. My computer tells me it’s 71F, but everyone else’s reads about 75F. I’ve worn a shorty underneath my 3mm full suit, so I’m OK, but Linda and Johnny are noticeably chilled.